Thyroid diseases are, arguably, among the most common endocrine disorders worldwide. India too is no exception. According to a projection from various studies on thyroid disease, it has been estimated that about 42 million people in India suffer from thyroid diseases. There are very few individuals in surgery that have generated so much controversy as the management of thyroid swellings. The controversial issues include classification and histology, diagnostic evaluation including needle biopsy, indications for surgery, management of incidentalomas of the thyroid, the role of frozen section, extent of thyroidectomy, management of neck nodes, the role of suppressive therapy, the use of radioactive iodine, and appropriate follow-up. The clinically solitary nodule may not always be a real solitary nodule but just a dominant nodule of a multinodular goiter (MNG). At times, it may be impossible to clinically differentiate malignancy in thyroid, especially in cases of thyroiditis. Furthermore, previously benign adenoma or MNG can have malignant transformation. The accurate diagnosis and appropriate management of thyroid swellings hence assume importance. A careful physical examination along with relevant investigations such as fine-needle aspiration cytology (FNAC) and ultrasonography (USG) may be required to reach an exact diagnosis and plan management accordingly. This dissertation highlights the current practices regarding the diagnostic approach and management of thyroid swellings. The current literature is reviewed to emphasize the changing trends of management. It is hoped that the results of this study will serve in reinforcing our present knowledge and providing guidelines in the management of thyroid swellings. The present study “study and correlation of clinical, radiological, cytological with histopathological findings in the diagnosis of thyroid swellings” was carried out in Jawaharlal Nehru Medical College and Acharya Vinoba Bhave Rural Hospital, Sawangi, Wardha, from July 2013 to October 2015. Our research was approved by the review board of Jawaharlal Nehru Medical College and Acharya Vinoba Bhave Rural Hospital. All patients with thyroid swellings irrespective of age and gender with thyroid swellings who undergo thyroid surgery. Those patients with thyroid swellings that do not undergo thyroid surgery. Clinical examination, USG, and FNAC were the most important diagnostic tool. Postoperative histopathology was used as a confirmatory investigation. Evaluation of all patients of thyroid swellings presenting to the surgery outpatient department of our institute was done. A thorough physical examination including indirect laryngoscopy was done in all cases. All individuals underwent standard investigations as required by their condition, such as USG, FNAC and thyroid hormones and thyroid-stimulating hormone assay. All patients with thyroid swellings who were fit for undergoing surgery were included in the study. X-ray neck was carried out as and when required to aid in diagnosis. Surgery was planned as per established standards and as warranted by the pathology in the goiter. In benign causes of goiter, the indication of surgery was pressure symptoms or patient's wish for cosmesis. Surgery was considered in all cases that were malignant or suspicious on FNAC. We adopted the “GAMES” criteria laid down by Shaha et al. at Memorial Sloan-Kettering Cancer Center to stratify the patients in low-, intermediate-, and high-risk groups, and the management was individualized accordingly. This study was only an observational study and no other intervention apart from that warranted by the patient's condition and accepted as a standard of care was done for the study per se. All information obtained on evaluation as above was recorded in a predesigned case record form. The data obtained from all the patients were tabulated initially on a worksheet-based program such as MS Excel. Various findings and observations were then represented by way of diagrams and charts. Incidences and relative frequencies of various outcomes/parameters under study were expressed as percentages/proportions. Sensitivity and specificity of certain modalities were assessed. In our study of sixty patients, the majority of thyroid cancer patients belonged to 21–40 years age group followed by the 41–60 years age group. 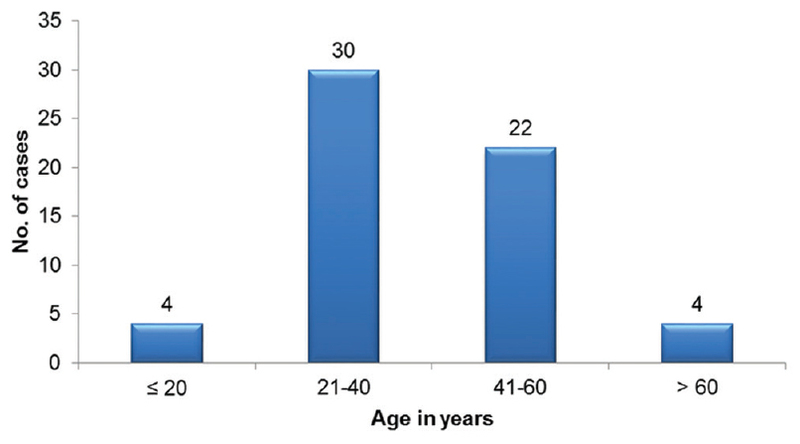 Maximum, i.e., 22 (36.67%) cases belonged to the age group 41–60 years, followed by 30 (50%) cases in the age interval 21–40 years, while there were 4 (6.67%) cases in the age groups ≤20 years and >60 years each [Figure 1]. In our study, females cases outnumber the male cases, the ratio of female: male is 5.7:1. 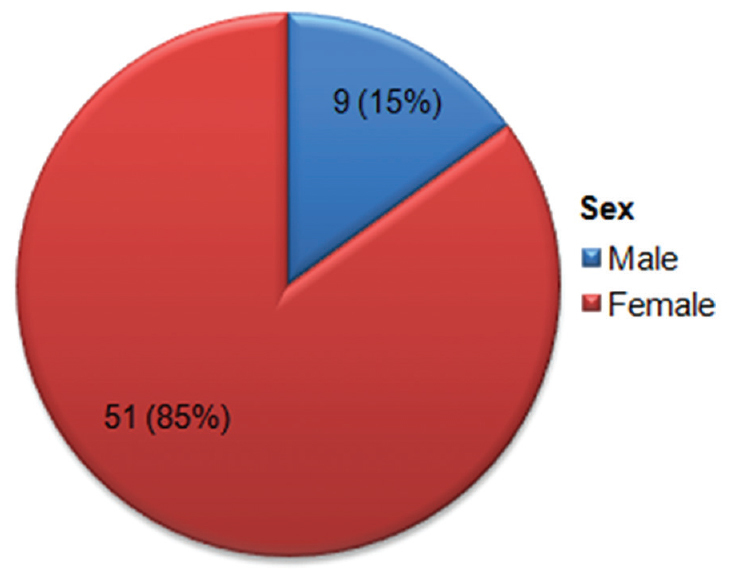 The proportion of males was 9 (15%) as compared to females 51 (85%) [Figure 2]. 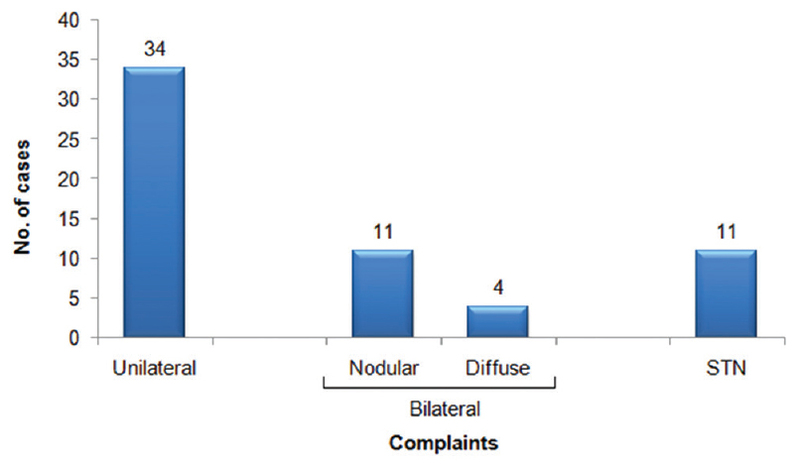 Out of total 60 cases, 34 (56.67%) were unilateral, followed by 15 (25%) cases with bilateral complaints and 11 (18.33%) cases with solitary thyroid nodule (STN) [Figure 3]. The cases were classified on the basis of the who classification, with respect to the grading of swelling. Maximum cases, i.e., 28 (46.67%) cases were WHO Grade 3, followed by 22 (36.67%) cases were Grade 2 and only 10 (16.67%) cases were Grade 1. 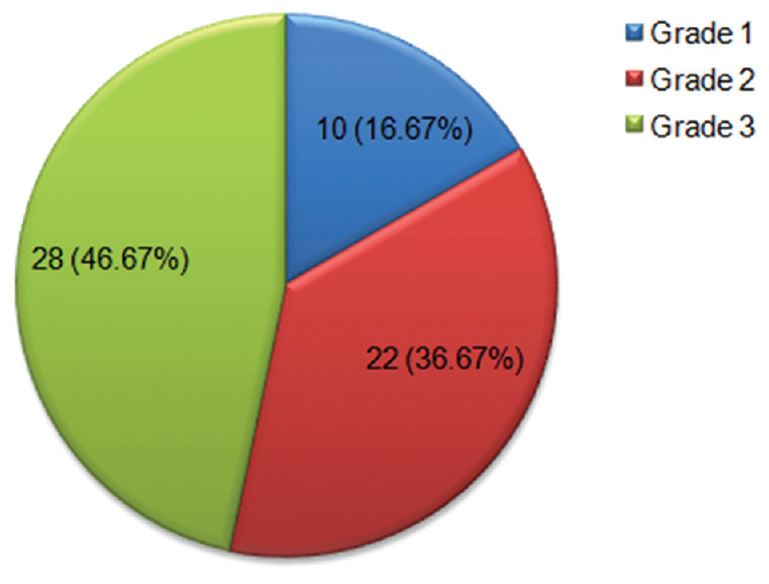 The pie chart representation of the distribution of cases as per grade is shown in [Figure 4]. 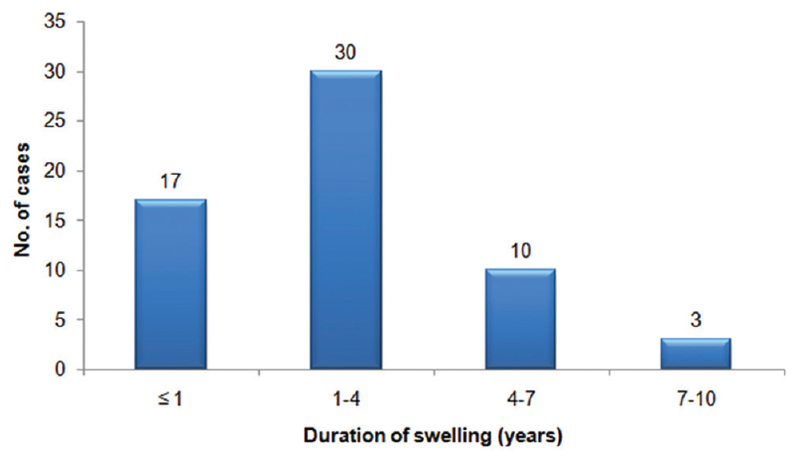 Majority of the cases, i.e., 30 (50%) cases had swelling for 1–4 years, while there were 17 (28.33%) cases who had swelling for ≤1 year, followed by 10 (16.67%) cases with duration 4–7 years. This is depicted in [Figure 5]. There were 23 (38.33%) cases with swelling on the right side, while 19 (31.67%) cases had it on the left side. Eighteen (30%) cases had swelling of both sides. Maximum, i.e., 57 (95%) cases moved with deglutition. Fifty-three (88.33%) cases were firm in consistency, while 7 (11.67%) cases were hard. Cervical lymph nodes were palpable in only 6 (10%) cases. There were 14 (23.33%) patients who presented with dysphagia along with thyroid gland enlargement and two patients complained of dyspnea and three patients (5%) of having a change in their voice (hoarseness) in our study. Provisionally on clinical examination alone, 7 out of 60 cases were diagnosed as malignant. On FNAC, the findings were as per [Table 1]. Maximum cases were diagnosed as MNG and colloid goiter. Eight out of 60 cases were diagnosed as being malignant (follicular, papillary, and medullary carcinoma). No cases of anaplastic carcinoma was detected. Surgery was performed as per the provisional diagnosis after the 3 parameters were analyzed, i.e., clinical examination, FNAC, and USG and taking into factor the spread of malignancy. Thus, neck dissection was performed for those cases that had cervical lymphadenopathy. Of total 60 cases, maximum, i.e., 47 (78.33%) cases were diagnosed as benign, while only 13 (21.67%) cases were diagnosed as being malignant on histopathological examination of the specimen postoperatively. Eight out of 13 cases (61%) were of papillary carcinoma. Two each of medullary and follicular carcinoma and one case of anaplastic carcinoma were detected. Thyroid surgery is the most common endocrine surgery performed around the globe. It got popularity in the early 20th century due to the development of safe anesthesia, invention of sophisticated surgical instrument, and adaptation of antiseptic techniques. In our study of sixty patients, the majority of thyroid cancer patients belonged to 21–40 years age group followed by the 41–60 years age group. According to Sushel (2009), age is a key prognostic indicator for well-differentiated thyroid cancer. Gupta et al. observed that the majority of patients (44%) were in their third decade of life. Our observations were also in accordance with the study by Dorairajan and Jayashree. In our study, females cases outnumber the male cases, the ratio of female: male is 5.7:1. Our observation regarding the gender disparity matches to the majority of studies which have been conducted earlier in Indian scenario or world scenario. Crile et al. had found a female to male distribution of 4:1 in goiters which came to their clinic. Similar male to female ratio was reported by Martenson et al. Bhansali et al. found a male: female ratio of 3:1 in their series, while Sarda et al. reported a ratio of 1:2.2 between males and females, in their 546 cases. Our results show a higher rate of incidence of goiters in females in comparison to the Indian studies (Bhansali et al. and Sarda et al.) and can be compared to the results determined by Crile et al. The ratio of benign lesions in females to that in men is 10.75:1 and that of malignant lesions in females in comparison to men is 1.6:1. Similarly, in a study done by Mathai et al. (1994), the male to female ratio in those with MNG alone was 1:10.8 while in those with carcinoma in MNG was 1:3.2 indicating that males with MNG had a significantly higher chance of developing a malignancy. Yao R et al. (2011) also observed that although more common in women, thyroid cancer typically presents at a more advanced stage and with a worse disease prognosis in men. According to Rahbari et al. (2010), the more aggressive types of thyroid cancer, anaplastic thyroid cancer, and medullary thyroid cancer have similar rates of incidence in men and women. Meanwhile, differentiated thyroid cancer of follicular cell origin, such as follicular thyroid cancer and papillary thyroid cancer, are more common in woman (Chen et al., 2009). An observation done by Kilofy et al. (2009) quotes that in females, the age-specific incidence rate rises sharply at the beginning of the reproductive years, with increasing age peaking at 40–49 years, while in men, the peak is at 60–69 years. The incidence rates equalize by 85 years of age. Women have an earlier age of onset but men tend to have more aggressive disease at diagnosis. Moreover, in most studies, male gender is associated with a lower disease-free survival and higher mortality (Gilliland et al., 1997). As the incidence of thyroid cancer increases, in particular papillary thyroid cancer, the gender differences observed are likely to be even more dramatic. Majority of the cases in our study, i.e., 30 (50%) cases had swelling for 1–4 years, while there were 17 (28.33%) cases who had swelling for ≤1 year, followed by 10 (16.67%) cases with duration 4–7 years. In a study done by Sengupta et al., 2012, the duration of swelling ranged from 6 months to 3 years. While in a study by Panchal et al., 2014, the maximum number of cases 133 (44.33%) had 1–6 months duration of swelling. Several studies observed patients with neck swelling presenting within variable durations. Maximum studies are there where the patients come for consultation at least after 1 year, very few are there where the cases have been presented before 6 months or 1 year (Mamun et al., 2014; Venkatachalapathy et al., 2012; Cady et al., 1979; Harmo et al., 1979). The 5-year survival for patients with localized thyroid cancer is 99.9%. The 10-year overall survival is significantly reduced to <10% in patients who are older and have distant metastases (Dadu et al., 2014). According to the clinical examinations, out of 60 cases, 53 were detected as benign cases while remaining 7 cases as malignant with a ratio of benign versus malignant – 7.57:1. No studies till date have examined the correlation of clinical examination for the diagnosis of malignancy preoperatively versus the final postoperative diagnosis. FNAC is now accepted as a cost-effective, minimally invasive, most sensitive, and specific low-complication nonoperative diagnosis for most of the thyroid lesions and is highly successful in triaging patients with STN into operative and nonoperative groups (Sengupta et al., 2011; Nggada et al., 2006). The location of the target lesion, careful searching for malignant cells, and repeat FNAC are the keys to successful diagnosis to plan a proper surgical management in thyroid mass (Agrawal et al., 2010; Handa et al., 2008). Thyroid nodules that should be considered for FNAC include any firm, palpable, solitary nodule or nodule associated with worrisome clinical features. 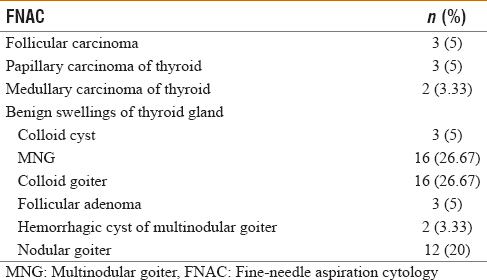 Fine-needle aspiration (FNA) biopsy remains the gold standard for evaluating thyroid nodules. Most clinical practice guidelines recommend FNA biopsy for nodules >1 cm in largest dimension (Doherty et al., 2009; Gharib et al., 2006). FNAC reports of our patients suggested that out of 8 malignant cases, follicular carcinoma and papillary carcinoma were found in 3 cases each while only 2 cases were of medullary carcinoma. Among the benign cases, maximum occurrence was of colloid goiter and MNG followed by nodular goiter and rest others. Very similar to our study, Rout et al., 2011 also observed that colloid goiter was the most common among the thyroid swelling (42.2%) followed by colloid goiter with cystic degeneration (13.2%). After the preoperative evaluation, patients underwent surgery. Seven out of 13 malignancy cases, i.e., 53.84% cases underwent total thyroidectomy with radical neck dissection. Three (23.07%) underwent total thyroidectomy with central neck dissection. Of the remaining 3, 1 underwent only total thyroidectomy and 2 underwent right lobectomy. We advised radiotherapy to those patients who underwent lobectomy only as the diagnosis was incidental on histopathology. One case was advised resurgery to complete the excision of thyroid gland; this case has been included in the 7 cases that underwent total thyroidectomy with radical neck dissection. The histopathology of 13 (21.66%) patients was suggestive of malignancy. About 3.33% cases were of thyroiditis and 75% cases were nonmalignant multinodular goiter. Nearly, 13.33% cases were of papillary carcinoma and 3.33% of medullary and follicular carcinoma. Only 1.66% cases were of anaplastic carcinoma. Huque et al. found nonneoplastic nodular goiter in 52.54%, papillary carcinoma in 13.55%, and follicular carcinoma in 3.38% cases. In the study by Wahid et al., histopathology findings were benign adenomatous colloid nodule in 77.8%, papillary carcinoma in 11.1%, follicular carcinoma in 5.6%, and medullary carcinoma in 4.2% cases. The study of Sushel et al. revealed that histopathology findings were adenomatous colloid goiter in 60%, papillary carcinoma in 7.85%, and follicular carcinoma in 2.1% cases. Most of our patients were middle-aged females with complaints of thyroid swellings for 1–4 years. Preoperative diagnosis was more conclusive for benign swellings rather than malignant swellings, i.e., few malignancy cases were missed. Thus indicating the need for better preoperative evaluation of all thyroid nodules so that appropriate surgery is chosen for the individual patient thus reducing the overall morbidity and mortality due to thyroid malignancies. Kochupillai N. Clinical endocrinology in India. Curr Sci 2000;79:1062-7. Stsjazhko VA, Tsyb AF, Tronko ND, Souchkevitch G, Baverstock KF. Childhood thyroid cancer since accident at Chernobyl. BMJ 1995;310:801. Brenner AV, Tronko MD, Hatch M, Bogdanova TI, Oliynik VA, Lubin JH, et al. I-131 dose response for incident thyroid cancers in Ukraine related to the Chornobyl accident. Environ Health Perspect 2011;119:933-9. Huque SM, Ali MI, Huq MM, Rumi SN, Sattar A, Khan AF. Histopathological pattern of malignancy in solitary thyroid nodule. Bangladesh J Otorhinolaryngol 2012;18:5-10. Wahid FI, Khan MR, Khan N, Khan Q, Javaid M, Haq N, et al. Goiter: An otorhinolaryngologist's experience at a teaching hospital. Khyber Med Univ J 2014;6:78-83. Sushel C, Khanzada TW, Zulfikar I, Samad A. Histopathological pattern of diagnoses in patients undergoing thyroid operations. Rawal Med J 2009;34:14-6.